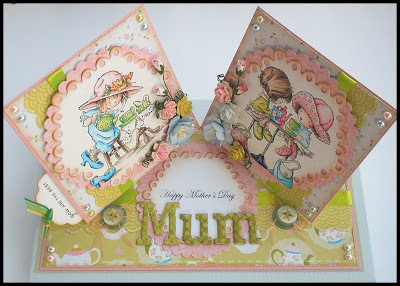 tonight I would like to share a Mother's Day card I have made for my Mum. I thought I would have a go at making a double easel card. It was easy putting the mechanism together only hard choosing a layout on such a small scale but I got there in the end with the help of a couple of very cute LOTV images. 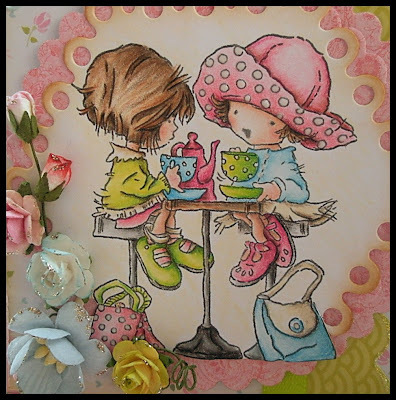 My Mum loves nothing better than a cup of tea and a good old chat and so everything about this card is perfect for her. 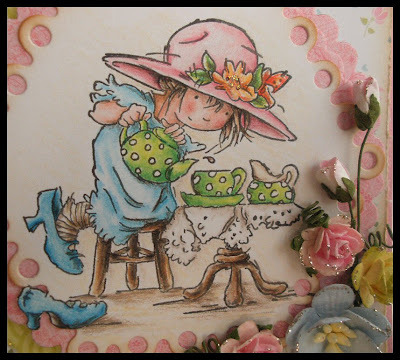 Oh wow Jenny,your mum will love this ,it's gorgeous! Wow this is drop dead gorgeous!! Oh my Jenny this is incredible! Oh Jenny, this card is magnificent!! Look at that fab attention to detail! Oh my, this is gorgeous Jenny, your mum will love this. Thanks for taking part in this weeks LOTV Challenge! Oh this is amazing Jenny and so beautiful. Deine Mutter wird begeistert sein!! Really delightful card. Love the double easel and the images are so beautifully coloured. Stunning! I love this idea and all the pretty girly colors! Congratulations on your LOTV Challenge design! Just beautiful! !